The clue was right there in the title -- Americans for Prosperity. They decided early against naming it Americans for the Rich, presumably. I expect it didn't test as well. But the mission remained the same -- protect the assets of the wealthy at all costs. Americans for Prosperity wouldn't admit to that being their goal quite so candidly, of course. Instead they say their mission is to “educate citizens” about economic policy, and then mobilize them in their own interests as advocates of lower taxes and limited government. Basically they have created a committed swarm of worker bees to protect the hive, and the fabulous lifestyle of the people who live inside it, from the ravages of taxation and the social compact. Americans for Prosperity has been very successful in luring ordinary people to stand sentry at their fabulous doors. It breaks your heart to see those same hard-working, modest people being sent out to the nation’s capitals and seats of government to advance the organization’s message with their hand-painted signs and colonial hats. There aren't many countries where ideological theory can so successfully hoodwink everyday fact, but this is an exceptional nation. The organization is of course inspired by the oil billionaire Koch brothers, the real prosperity behind Americans for Prosperity. It focuses on eight areas that are of most concern to billionaires -- budget and spending; taxes; property rights; health care and entitlements; banking and financial services; labor, education, and pensions; energy and environment; and technology. In politics it's called astro-turfing when an organization exhibits fake grassroots activism that's really organized from the top down. 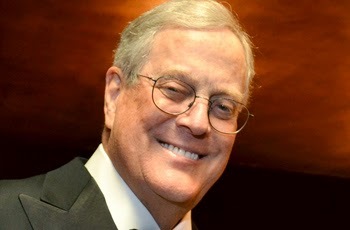 The Koch brothers will tell you, of course, that their group is an expression of the anger of ordinary citizens at President Obama's policies and economic agenda, but follow the money. Interestingly, and I suppose inevitably, Americans for Prosperity has often operated independently of the Republican Party, despite issuing invitations (often accepted) to its leading lights to speak at its events. The group’s entire focus is on economic policies insofar as they impact on the rich, which is still a bipartisan concern. It would be terrifically foolish to underestimate the ways in which Americans for Prosperity's message resonates with ordinary people. While concern about taxation is a terrific reality for the billionaires boy's club that has created the organization, it's an aspirational, ideological and almost theological concern for the ordinary working stiffs who man their phone lines and turn up for their protests too. Those same working stiffs may not live in a gated community or own a Rolls Royce or drink in oak panneled Ivy League clubs and read The Wall Street Journal, but in an alternate universe they might have, and that's worth fighting to protect isn't it? The American Dream needs careful nurturing, otherwise we might wake up and see where we all are. I admire their passion, but I don't think it's going to prove any more effective than the recent or I suppose forthcoming government shutdowns. The reason for this is something that the men at the top of the Americans for Prosperity pyramid scheme will understand better than the ordinary people who support their goals. Only about 30 percent of Americans oppose Obama's economic plans overall. But that news seems to keep astounding the vast majority of the Tea Partiers who have spent the last two election cycles watching dumbstruck as their economic and social worldviews are rejected again and again by the American electorate. Nobody cares outside the small base. In the 60 years after World War II, the United States of America built the world's greatest middle class economy, then it set about unbuilding it -- demolishing it really. The Bush years, with their unprecedented tax cuts for billionaires and endless international wars, were a tragically lost decade for the middle class. And when the growth finally returned, we found that it overwhelmingly favored what we call the investment class, the top 20 percent, and especially the top five percent (and the top one percent percent more than than all the others combined). So Americans don't need to mobilize to support prosperity, it turns out, since the prosperous are now enjoying the greatest moment in American history to be wildly prosperous.